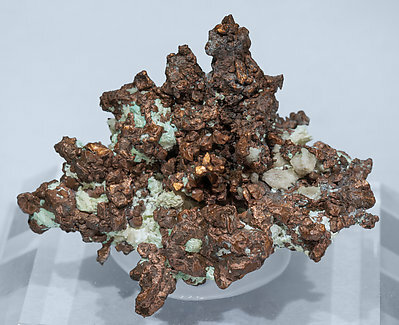 Arborescent aggregateof small but quite well-defined crystals, from a locality well known for its secondary copper species but where native Copper has been scarcely cited. 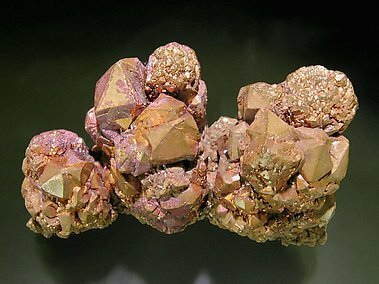 Arborescent growths of slightly deformed cubo-octahedral crystals with very well defined faces and edges and on matrix. 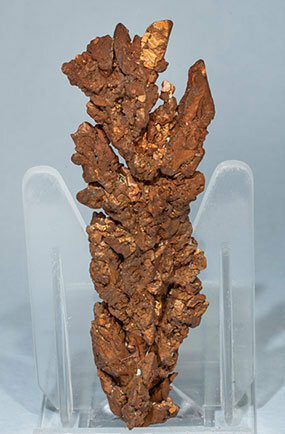 The sample is from a locality that is not well known by collectors. 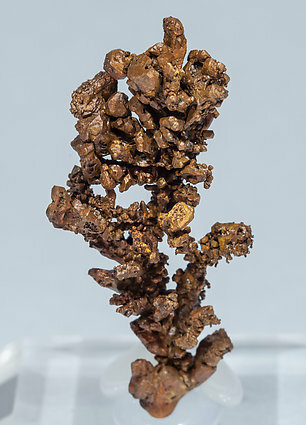 Very aerial dendritic growth with dodecahedral crystals that have very well defined faces and edges, with slight curvatures. Arborescent growth with deformed crystals in some areas on the sample and well developed crystals with very well defined faces in others. With good color and luster, something not so usual with such samples. Floater dendritic aggregate of small but very sharp octahedral crystals, also with the minor faces of the dodecahedron, a lot of them elongated and all have excellent color and luster. A nice miniature, very representative. 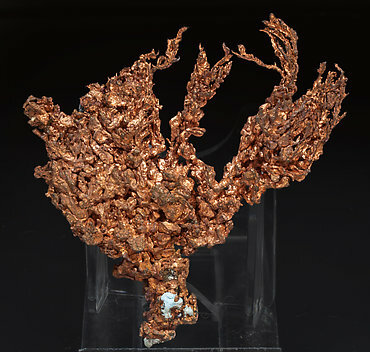 Very aerial and elegant dendritic growth with very elongated Copper crystals that near the base become larger and more equant and have better defined faces and edges. We’ll send to the buyer the original label and also a copy of the computer card with the full collection catalog text. 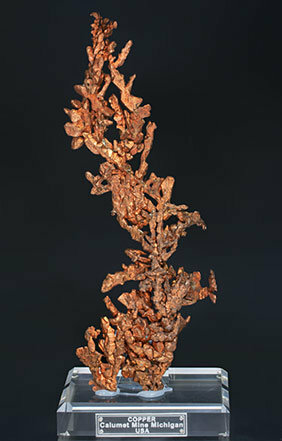 Very elongated single Copper crystal with the Spinel law twin. The sample is from a Russian locality that is a great classic but of which there are very samples. A novelty at Tucson 2017. 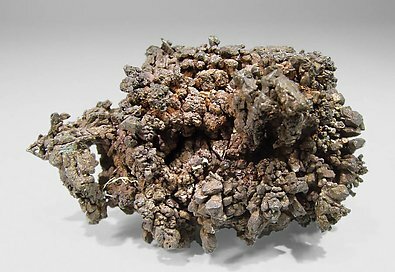 Dendritic aggregate of elongated octahedral crystals, with parallel growths and slight curvatures on the edges. 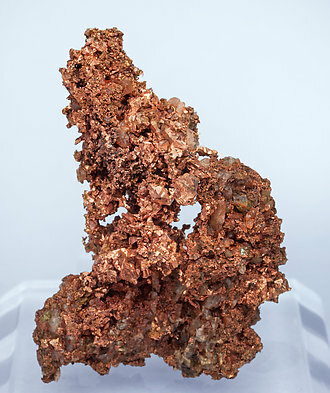 It is from a locality not yet well known for collectible Copper samples. Very aerial dendritic growth of flattened complex crystals, some of them with very well defined dodecahedral faces. It is bright and with small remnants of a rocky matrix. 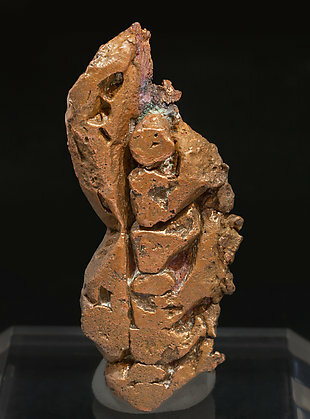 The sample is from the Vallecillo collection, Madrid. 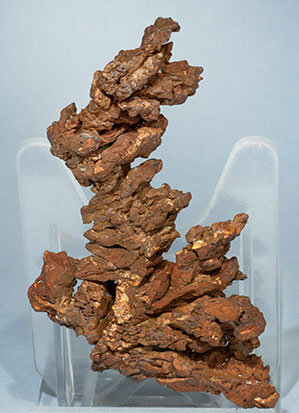 The sample is from a locality that is unusual in non-Australian collections. It is aesthetic, with dendritic growths of equant crystals that are very rich in forms with very well defined faces of the predominant dodecahedron. 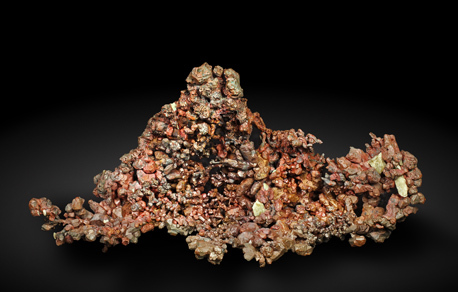 An infrequent mineral curiosity. A novelty at Tucson 2017. 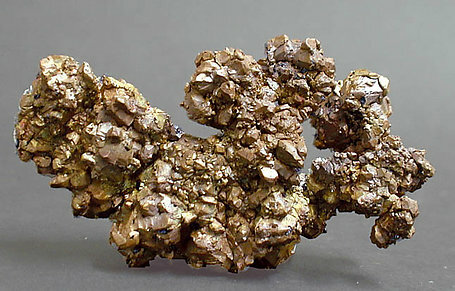 Dendritic aggregate of elongated dodecahedral crystals with parallel growths and slight curvatures on the edges. 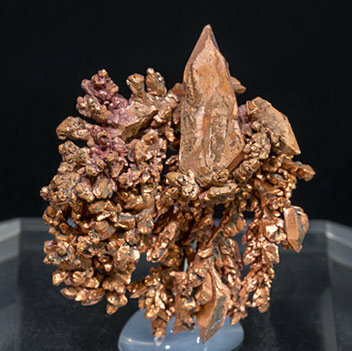 It is from a locality not yet well known for collectible Copper samples. A novelty at Tucson 2017. Dendritic aggregate of elongated octahedral crystals with parallel growths and slight curvatures on the edges. 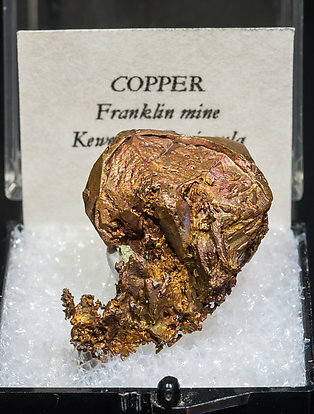 It is from a locality not yet well known for collectible Copper samples. 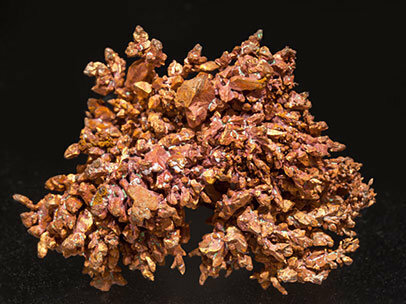 Parallel growth of Copper crystals with very well defined faces and edges and skeletal growths on the back. We’ll send to the buyer the original label and also a copy of the computer card with the full text in the collection catalog. 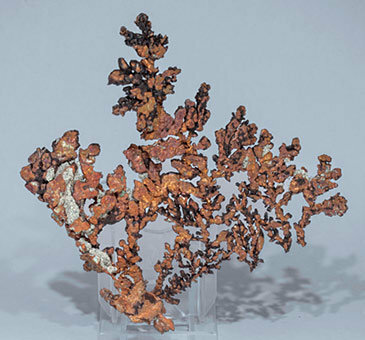 Dendritic growth, very esthetic, of Copper crystals with perfectly well defined faces and edges and very visibly twinned according to the Spinel law. Very aerial dendritic growths with parallel formations of extraordinarily sharp and very well defined octahedral crystals. 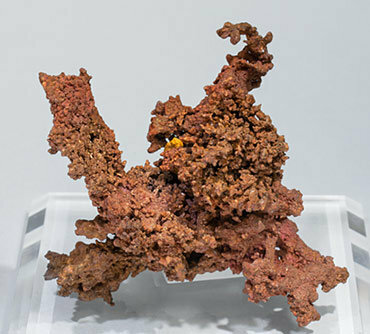 Dendritic growth of crystals that have very well defined faces and edges, with the dominant forms of the octahedron and the dodecahedron. 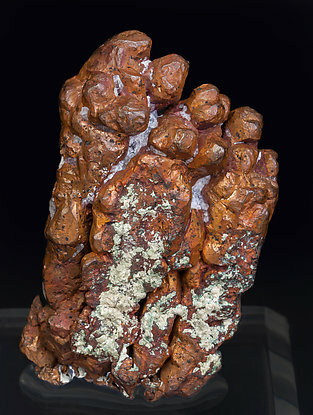 A copper “foot”. Parallel growths of crystals that have very well defined faces and edges with a predominant octahedron and dodecahedron, some of them almost complete and all them very bright. 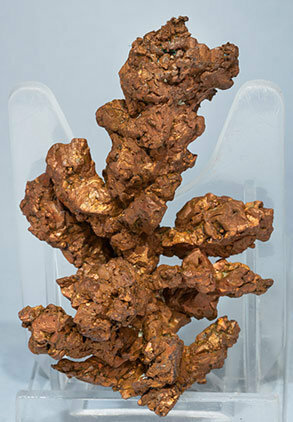 Floater aggregate of Copper crystals with a considerable length. Their faces and edges are unusually well developed, forming parallel growths. The sample is from the Carles Millan collection (catalog#1111), who’s computer card we’ll send to the buyer. 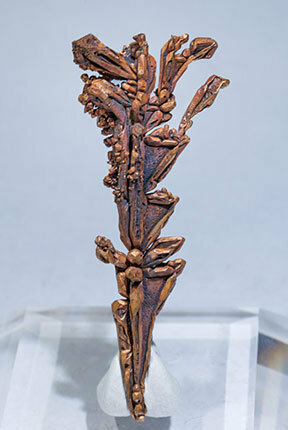 Very aerial arborescent growth of very well defined crystals, slightly elongated, with the octahedron and the dodecahedron as dominant forms. 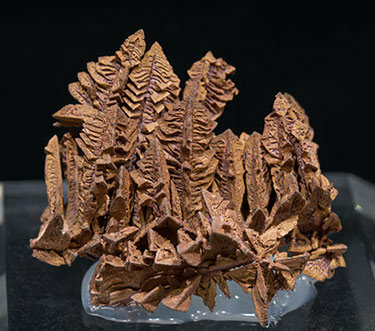 Dendritic growth with a clearly dominant crystal of a good size, with the well-developed faces of the dodecahedron and the octahedron. 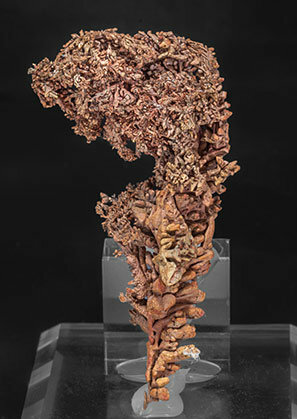 Large-sized dendritic growth with partially flattened and complex crystals with very well defined faces and predominant dodecahedral and octahedral forms. 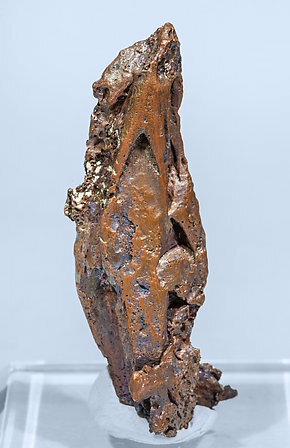 Due to both its size and its quality, we could define it as a “Museum sample”. Extraordinary miniature. Faces and edges of the crystals have a very uncommon definition and the crystals forms are complex. Furthermore they are practically unaltered so they have an intense color and luster. A miniature from a classic locality. 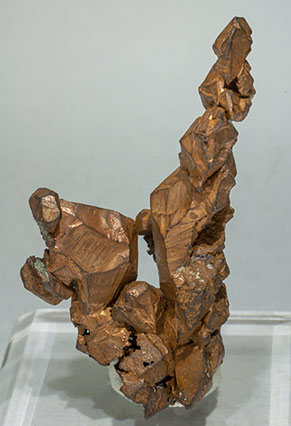 Arborescent growth of Copper crystals, some of them well defined. 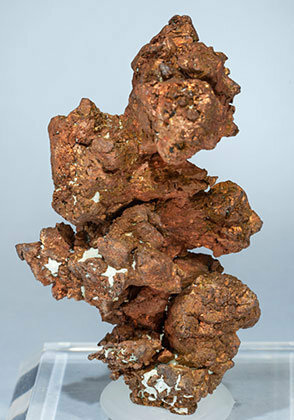 A nice old classic specimen: a floater copper, complete in all sides, pretty rich and with minor Cuprite crystals on the rear. Excellent for the locality!